It’s amazing to look back at everything we’ve learned from our customers since we first released HoloLens. Across manufacturing, education, retail, gaming, and many other industries, developers and businesses are using mixed reality in their daily workflows and giving us feedback on what they’d like to see next. When we look across all the mixed reality solutions that customers have been building over the last few years, two things really stand out: collaboration and spatial awareness. Customers want to easily share their mixed reality experiences and place applications in the context of the real world, and thereby increase their efficiency and achieve greater productivity. Yesterday at MWC Barcelona, we announced Azure Spatial Anchors, a mixed reality service that enables you to build a new generation of mixed reality applications that are collaborative, cross-platform, and spatially aware. Today, we’re sharing two application patterns gaining momentum across industries, and how Azure Spatial Anchors can help you deliver them with greater ease and speed. Mixed reality enables us, as humans, to do more and to collaborate with those around us in a more natural and intuitive way. Whether it’s architects and site workers reviewing the day’s plans for a new construction project, designers and managers collaborating on next year’s car model, or a team of surgeons planning a procedure before operating, mixed reality has changed the way that humans now design, review, and learn together. Across industries, one of the top asks from our customers is to make it easier to share such experiences in mixed reality. As one example, Pearson Education enables nursing students and professors to practice diagnosing and treating ill patients in 3D in the real world before the pressure of a real case. Students and professors may be using HoloLens devices, or they may be using mobile phones and tablets. Until today, sharing mixed reality experiences across devices and across platforms required either environmental setup (such as QR codes) or complex coding to handle the different sensors and endpoints. Azure Spatial Anchors provides a common coordinate frame for shared mixed reality experiences across HoloLens, iOS, and Android devices without any environmental setup needed. 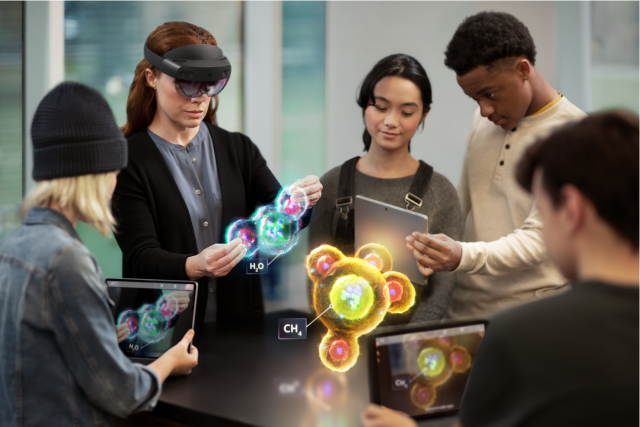 With Azure Spatial Anchors, everyone can collaborate in mixed reality, whether they are in a heads-up, hands-free experience on HoloLens devices, or they are participating via mobile phones and tablets. Sometimes, the best way to work on problems and find solutions isn’t in the traditional conference room; oftentimes, better, faster decisions can be made by seeing insights and data in the real-world context of the problem itself. For example, our customers in manufacturing want to be able to walk along the factory line and easily visualize the status of each machine in order to quickly navigate and focus on the equipment with issues. Until today, precisely mapping a large space and persisting that spatial understanding was not possible for most of our mixed reality customers. Azure Spatial Anchors is designed for this: connecting the right data to the right people in the right places, so people can work like they live—in 3D. Internet of Things (IoT) can make your connected solutions even stronger. Most IoT projects today start from a things-centric approach, but with Azure Digital Twins, we’ve flipped that around. We’ve found that customers realize huge benefits by first modeling the physical environment and then connecting existing or new devices (“things”) to that model. With Azure Spatial Anchors and Azure Digital Twins, customers gain new spatial intelligence capabilities and new insights into how spaces and infrastructure are really used. 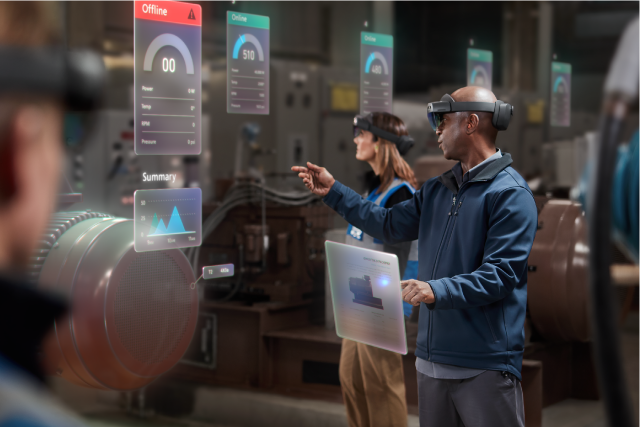 By visualizing IoT data onsite and in-context on HoloLens or mobile devices, people can uncover and respond to operational issues before they impact workstreams. Have an idea of what you want to build? Dive into our documentation. Need some ideas on how to design and implement mixed reality solutions? Explore reference architectures for collaborative design review, facilities management, and contextual training. Thinking about building a cross-platform mixed reality application? Start with our shared mixed reality experience quickstart. We would love to see what you create, and we hope you share it with us via #Azure and #SpatialAnchors. We can’t wait to see what you build!